Located in Midland, Michigan, Gutter Guard Installation professionals are experts in installation and maintenance. One of the main elements of keeping a clean and clear pathway to your home’s gutter system is cleaning them and maintaining them. With residential and commercial gutters, it’s a requirement in the Michigan region. More damage can be done if they are not; in fact, this type of job should be left to the professionals such as the Midland Gutter Pros. The few types of gutter guards which can be installed can be found on the internet. All in all, when viewing such guard installation methods found on YouTube, you’ll notice the various styles these guys use. What you really want are the pros to handle it for you in order to do it right. When homeowners have gutter guards around the exterior sides of their house, it’s common to inspect them year round. When it rains, snows, or during windy weather, debris can accumulate around them and even inside them making it hard to clear the way for water to filter through these gutters. 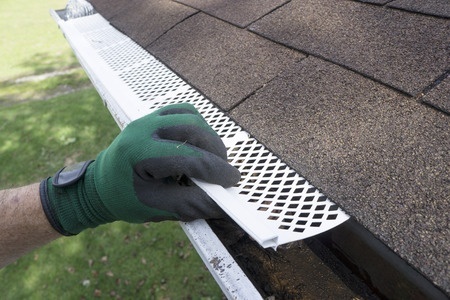 The main thing homeowners want to look for is debris.In general, animals such as birds, squirrels, raccoons, and cats can will sleep or nest in these gutter guards located atop a residential home. Never underestimate the critters around gutter guards. Gutter guards styles. The various styles of guards are the following. 1. Mesh gutter – These are filled with holes and, hence, are known as mesh because they look like mesh material. The small looking holes are actually considered better because they will not clog comparably to the larger holes. Actually, the smaller holes are considerably best because they sift out the debris. They allow the water to go through as well. These are attached to the shingles of the roof. 2. Reverse curve – This type of guard will encourage the debris to go downward. There should be a slit which helps the debris fall directly down when they get to that particular point. 3. Nylon – These prevent the snow and ice to accumulate onto the gutters. In fact, they will not attach to the shingles like much debris is known to do (i.e. trash-bags, leaves, cans…). 4. Bottle brush – Comparably, these work especially well because of the “pokey like bristles” which helps critters such as birds landing on them to nest. They face up so when leaves, trash or anything lands on them they’ll be held up while the water flushes right through. 5. Foam type – This is made from plastic which fits into the gutters. They are known to block all types of debris which can fall onto the roof and then onto the gutters. 6. Non-gutter cover – These have replaces gutter and instead are “thin louvers” which end up redirecting the trash or debris (with the rain) off and instead, sliding down the roof. Nevertheless, with these gutter guard installations in Midland, home owners can pay for the pros to install a gutter guard installation cost which will be much more affordable. Installing gutter guards under shingles is a little harder. Although they can be done, but again, it’s best to allow the professionals to do it. There are various ways to do this since but how to install gutter guards should be left to pros such as the Midland Gutter Guard company. Finally, with their gutter guard installation instructions, they keep their debris out and the rain or snow water filtering through to go where it should, and that’s the ground. With a minimal amount of gutter guard installation companies around the region that know what they’re doing, selecting the right gutters for a commercial or residential home should always be performed by the best. Contact the Midland Gutter Guard company today! Have you cleaned your gutters lately?